SALT's CEO Shawn Owen & CD Caleb Slade at d4c. Anyone involved in blockchain or crypto will tell you that the space needs mass adoption to continue growing and building. And while blockchain technologies and cryptocurrencies have seen a huge buzz in the past year, even making the cut for a major feature on John Oliver’s “Last Week Tonight,” there is still a long way to go on educating the masses on these pieces of “new” technology. That’s why it’s so important to bring communities together and provide education for entering what many perceive as a daunting space. 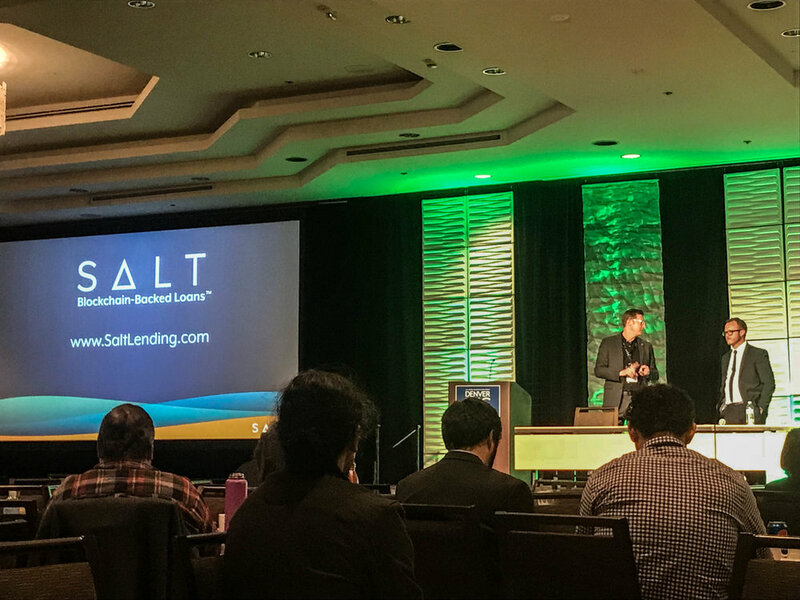 Recently, Denver’s blockchain-backed lending firm SALT did just that with their Denver Day 4 Crypto event. The conference featured keynotes by major blockchain players like Peter Vessenes (New Alchemy), Erik Voorhees (Shapeshift), and Shawn Owen (SALT). But instead of focusing on the most emerging pieces of blockchain trends and announcements like many of these conferences do, this day was about onboarding individuals to jump into the crypto space. SALT even gave away some of their own tokens and free Keep Keys to anyone who admitted to not yet having bought any cryptocurrency. The day had discussions for those just entering the crypto market like “How to Buy and Sell Crypto” and “Value Through Token Economics” but the event still managed to keep those more educated in the space invested with panels on topics like “Charitable Giving in Blockchain” and “The Future of Blockchain.” The day even featured expert discussions on blockchain’s current regulatory environment and the basics of tax reporting. Companies like Polymath, Realblocks, and even meal-delivery blockchain service Nostrum also explored how blockchain is changing their industries. Overall, SALT did a fantastic job of helping individuals interested in the space learn more, network with key players and companies, and even purchase their first cryptocurrency. The blockchain needs more events like these to connect people to this technology and show them how easy it really can be to setup a crypto wallet and HODL. Cheers to SALT- learn more about their business here. Photos Featured in 303 Magazine "Colorado Music You Should Know About"
Commissioned Feature in Medium for MARKET Protocol on "The History of Derivatives Trading"
Commissioned Feature in Medium with MARKET Protocol on "Understanding the DEX Revolution"
Adventure, travel, and explore with the blond on the run. I’m a Colorado native and freelance content creator who goes where the adventure calls. If I'm not at a show, I'm traveling the globe! I work often in the tech, travel, and music spaces. I’m also a huge blockchain enthusiast. blondontherun.com is a place for me to share stories from these spaces with you. I aim to inspire you to chase your own adventure, find the most useful products and tips to take you there, and then get lost doing it! For a full list of brands and people I've worked for and with, click here.